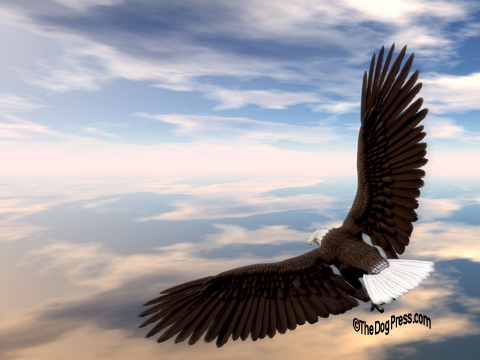 The Eagle, wiser than the owl, sees America and freedom from a higher perspective but me, I'm just a little bird that picks up dog news and listens to people chatter. 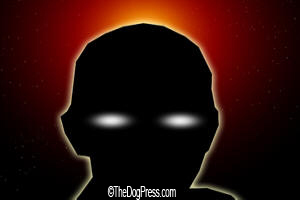 I was flitting around from line to line when I heard that an icon in dog news, actually, that's what it was called, Dog News, anyway it folded. There was so much buzzing about people trying to get their money back, it was hard to filter out the facts. A nice sounding lady kept repeating that it wasn't really their fault, that "the boys only worked for Harris Publications." One guy kept trying to tell them about Stanley Harris but most of the chatter was about "Matt and Gene" and that is wasn't their fault, they just worked for that Harris place. Some guy with a deep voice kept butting in, saying Harris owned over a hundred magazines and "some of them were pretty "raw". I know dog owners like to feed raw but I'm not sure what that meant. The lines got so hot I had to lift off for a minute but when I alighted again, they were still smoking. Chatter ranged from "they will be so missed" to "what about the ads I paid for?" The deep voice said "it pays to protect your nest." Everyone agreed that the boys were scrambling to do that but one old biddy kept cackling "it's been way over a month and I'll never see my money again!" Tired of dog news and gossip, I flew off in a different direction. I was trying to follow up on something I've been pecking on since 2009 when I was sitting on the wires listening to all that squawking about "animal rights" buzzing through my feet. You remember. What sounded like sub-human chickens wanted to stop all dog breeding with something they called spay-neuter legislation. They vowed to "get rid of show dog breeders." Somehow, the puppy mill breeders escape their wrath. I found a new perch and thought about humans who are notably late sleepers but how dog owners finally opened their eyes when they heard they would have to spay and neuter pay big fines and fees. I hope those dog owners don't decide to breed cats. Wondering why cats seem exempt from the tax collectors, I heard a loud screech. Across the road, on a limb that provided clear lift off, was my hero, Mr. Eagle. He gave me the eye. 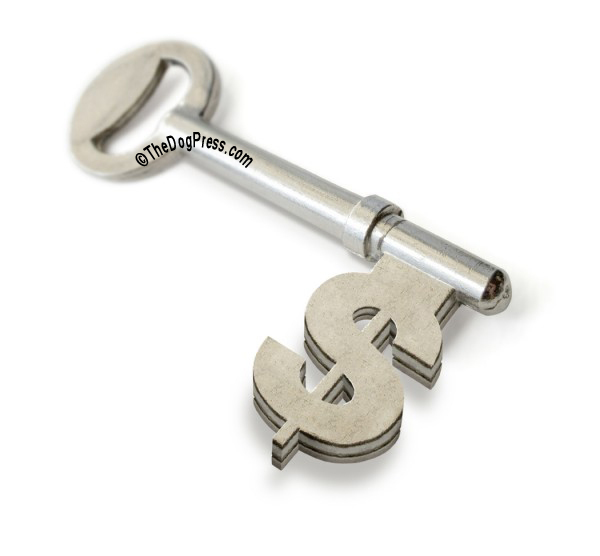 "If that money-grubbing law passes, the local roosters can invade homes without any warrant. I will never understand why people don’t learn from us birds." He shifted his weight, preened his chest. "Haven't they ever been dive-bombed by a mockingbird? If a 6 ounce bird can make a 200 pound man cower and run, humans should get the message about protecting what is theirs." Intrigued, I flew over to his tree and found a little twig to alight on. Preening a wing tip, Mr. Eagle muttered "Most humans have forgotten how." I wasn’t sure if he meant protecting their nests or flying the highest. He is closest to the Creator so he's able to see things clearly. You might have noticed I’m not bashful so I asked what he meant. Mr. Eagle turned his head, slightly cocked over, you know how they do, and he looked me right in the eye (they do that too) and he said people are no longer taught about the Constitution in their schools so most of their chicks grow up not knowing what it was their ancestors fought to protect. He continued “The Constitution and The Bill Of Rights are just a couple of documents humans don’t understand. I don't know why they still use me as a symbol!" Actually, he said a lot more than that. 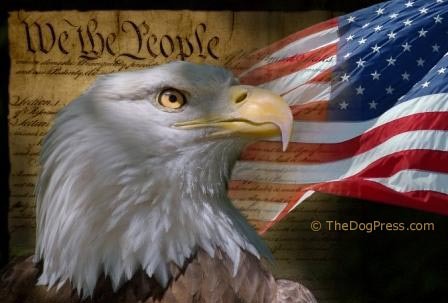 Mr. Eagle has been known to screech loudly when it comes to the United States Of America! Maybe that's why he is called the American Eagle. Whatever. He always makes me feel small in my knowledge of humans but then, I’m just a Little Bird in the presence of a legend. 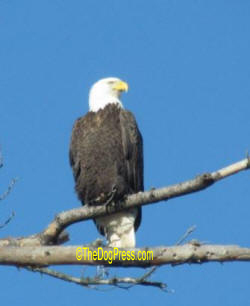 Mr. Eagle gazed into the far distance for a long moment, then he turned to me. I fluffed up my feathers to make myself look a little bigger before I dared to say “I'm not sure I understand sir." Unfurling and resettling his wings, he almost knocked me off my perch before replying so softly I had to open my beak to hear him. Mr. Eagle glanced down at me and then, flexing those frightful talons, he slowly extended his wings. The wind came to him obediently, caressing his flight feathers and then gently, it lifted him from the limb. 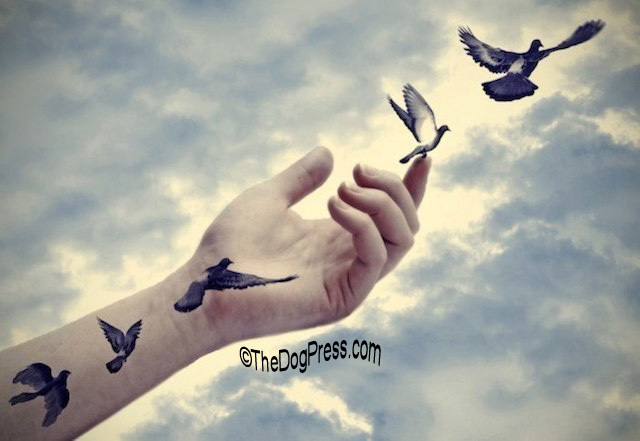 I held tight to my little branch as the downdraft from his eight foot wingspan buffeted the air around me. When I dared look up, Mr. Eagle was soaring to some distant place that little birds like me can never reach. I haven't seen him since but what he said about being "united" stuck with me. I hear the chatter. People talking about elections and "tight money" and I think what Mr. Eagle said was never more true than in 2016. The country he symbolizes is in trouble. He didn't mention that. Too proud I guess. But I know. I hear the buzz from coast to coast. Something tells me you "people" are getting ready to spread your wings and stand up for your country. Me? I'm looking for a worm.